February 24, 2016: Town of Nantucket acquires it's first electric vehicle for it's municipal fleet! The 2016 Ford Fusion Energi is a plug-in hybrid electric vehicle, which will be used primarily by the Health Department. The vehicle was purchased in part through a $5,000 grant secured by the Energy Office as part of the MassEVIP Program! ​Winter 2016: WPI Research Project "Determining the Viability of Electric Vehicles on Nantucket"
Working with the Town Planning & Land Use Services Department, the Energy Office has managed the process of applying for grants from the Massachusetts Department of Energy Resources (DOER) to install six public electric vehicle charging stations, now in operation, at three easily accessible locations: behind the Town Hall Annex at 37 Washington Street, Nantucket High School and Hanger #2 on Airport Road. Electric Vehicle Charging Stations Coming to the Island! In October 2010, the Massachusetts Division of Energy Resources announced that grants would be provided to towns wishing to install charging stations for electric vehicles. Such charging stations are essential infrastructure for the early public adoption of electric vehicles, or EVs. By December 2010, the Nantucket Planning and Economic Development Commission submitted a grant proposal to the Division of Energy Resources for charging stations to deploy in a network on Nantucket. In order to meet requests from 25 cities and towns, the DOER negotiated agreements with two manufacturers of EV charging stations-- Coulomb, and Aerovironment (or AV), both based in California. This delayed awarding of the grants. Nantucket subsequently received a grant for 5 dual charging stations and $1,000 per station for installation. Two towns on the Cape also received grants—Falmouth (3 stations) and Barnstable (4 stations). The dual stations granted to Nantucket have since been swapped out for wall mount units that are less obtrusive and less expensive. Originally four sites were selected---the Greenhound Station, behind the Town Hall Annex, the back of the High School, and Hangar 2 at the Airport, all having been reviewed by the Planning Department, the Project consultant, Scott Ridley, a local electrician, and an engineer from National Grid to ensure their feasibility and practicality. On January 10, 2012 the Nantucket HDC approved the installation of EVCs at 3 of the 4 locations, ruling that the Greenhound location was not an appropriate site. 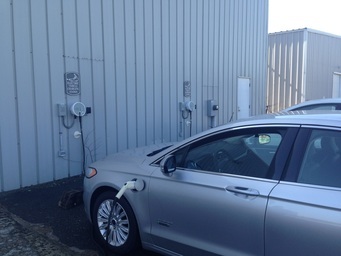 The HDC requested that the wall mounted charging units be custom colored “Quaker Gray.” The six electric vehicle charging stations were installed in three publicly accessible areas on the island on May 10-11, 2012. Nantucket is the first town, of the 24 municipal DOER grant recipients, outside of Boston to get its electric vehicle charging station network installed and operating—which will provide free public charging for the next year. The Town of Nantucket hopes that the the installation of charging stations will encourage residents and tourists to shift from internal combustion vehicles to electric vehicles. August 14, 2014: Porsche Panamera SE Test Drives & Electric Charging Demo! The Energy Office and Porsche Cars North America, Inc. hosted a very special 2-part ﻿event on August 14! Public Charging Demonstrations using the Panamera SE Hybrid took place at Hanger 2 on Airport Rd. Afterwards, public test drives with professional Porsce Driving Instructors were available to the public at the Nantucket VFW (22 New South Road). Energy Office hosts Tesla-S "Public Viewing and Charging Demonstration" ! 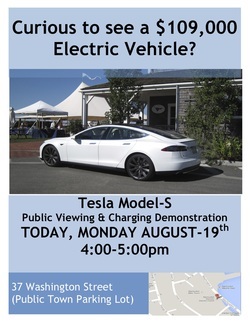 (August 19, 2013) Over two dozen Nantucket residents and visitors had the chance to view two Tesla Model-S all-electric vehicles at the Town's Public Electric Charging Stations at 37 Washington Street. Tesla Motors was a sponsor in this year's Nantucket Race Week, and offered to showcase two of their cutting-edge, award-winning vehicles to the interested public--valued at $109,000 and $70,000. There was also an informational demonstration of how the Tesla vehicles utilized the Town's electric vehicle charging stations for power!